Vodafone, needed to manage their unique records management process across hundreds of sites throughout the UK. A new and effective system was required, to track and manage over 90,000 archive boxes, and the activity surrounding them. Interfacing with records management (including O'Neil's software) was also a key requirement. We held a thorough requirements analysis and process mapping session with key Vodafone stakeholders, to identify waste in the existing process and to determine the new design. Using time-tested document management software modules, we tailored them to the specific needs of the client. By streamlining the process and maximising efficiency we saved them £400K over 2 years. 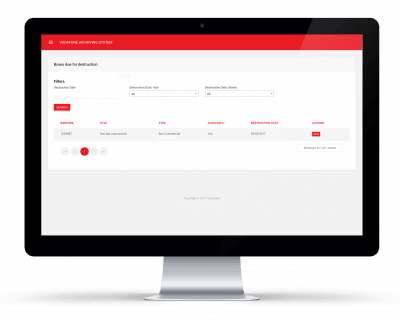 "We appointed Switchstance to develop and implement a new front-end archiving solution, working to very tight timescales. They were an excellent supplier to work with; dedicated, worked tirelessly on the project, whilst proactively resolving issues and offering solutions. The system was delivered on time and under budget. I’d certainly recommend them to other clients."